Wearable robots (WR) are person-oriented devices, usually in the form of exoskeletons. These devices are worn by human operators to enhance or support a daily function, such as walking. WRs find applications in the enhancement of intact operators or in clinical environments, e.g. rehabilitation of gait function in neurologically injured patients. Most advanced WRs for human locomotion still fail to provide the real-time adaptability and flexibility presented by humans when confronted with natural perturbations, due to voluntary control or environmental constraints. Current WRs are extra body structures inducing fixed motion patterns on its user. The aim of the BioMot project is to improve the efficiency in the management of human-robot interaction in overground gait exoskeletons by means of mixture of bioinspired control, actuation and learning approaches. Our aim is to show how the embodiment of bioinspired and architectural mechanisms can allow a user to conveniently alter the behaviour of WRs for walking. The final goal of the project is to deliver novel ambulatory wearable exoskeleton technology that exploits neuronal control and learning mechanisms and provides a) more energy efficient cooperative (human-robot) performance, and b) adaptive assistance based on the user's residual and voluntary action. BioMot's exoskeletons apply adaptive assistance as a function of real-time estimation of human effort provided by a detailed neuromusculoskeletal model that computes neuromuscular activity (surface electromyography, EMG) to predict joint moments and hence prescribe the exoskeleton function. Gait detection algorithms based on human performance (brain signals, EEG) and embedded sensors (kinematic and kinetic) are developed for decision making, handling transitions or volitional changes in the task (such as gait speed). Local reflex-based joint controllers are designed to allow for automatic adaptation when confronting changes in the interaction. At the physical level, intrinsically compliant actuators are developed to exploit natural dynamics of movement, orchestrated by the control system for economy and stability. A global learning scheme modules joint compliance as a function of gait efficiency and semantic signals infered from user demand. We aim to demostrate that WRs, if equipped with such embodied sensory-motor skills can fill the gaps necessary to realize a more sustainable and efficient human-robot interaction. On one extreme of the spectrum of applications we will develop a WR as a task focused assistant for gait training after incomplete spinal cord lessions. On the other, as an assistive and monitoring robotic device that interacts with the operator while performing a task optimizing the efficiency in human-robot cooperation. This system is not designed to and will not be applied for military applications. A cognitive system for a wearable gait exoskeleton that assists overgound human walking. The cognitive system processes biomechanical and electrophysiological signals to adaptively assist the human movement based on the user's contribution and performance. The wearable 6 DoF exoskeleton assists hip, knee and ankle movements with compliant actuators that can be transparent to the user and store and release energy. BioMot's assistive exoskeleton flexible built-in intelligence in its artificial brain and muscles allows to exploit the natural dynamics of overground walking. As a wearable robotic trainer for gait disorders, BioMot uniquely provides overground gait training, promoting the patient effort to induce recovery, and assists as needed the patient during performance of the exercises. The training sessions enabled by BioMot trainer will go beyond common available protocols, including variations of speed, turning and improved negotiation with transitions. This workpackage will contribute to the establishment of the basis for the novel cognitive architecture for WRs (summarised in Figure 2) based on experimental analysis of neurophysiological, biomechanical and perceptual responses. Experimental studies will be conducted with healthy and pathological subjects to gather data for simulation and testing of gait processes with electrophysiological and biomechanical representations. The research studies in this work package are expected to account for the required understanding of motor primitives (kinematic and EMG features), cortical function (electroencephalography, EEG) and the key features in motor control for adaptation to the environmental and task changes under study. Both specific and general aspects of cognitive function during gait initiation and its contributions to changes in direction orientation during walking in humans will be studied with non-invasive techniques. This is expected to shed light over the still controversial understanding of synergistic control of muscles for gait. The algorithms to model the behaviour of neural circuits at sensory-motor levels for partial control of the locomotion will be modelled with data from these experiments. This task will be led by UMH. This WP will investigate the actuator technology suitable for compliant performance in WRs. The approach is to design actuator structures with the variable impedance for the required flexibility and adaptability of the experimental conditions. The approach is to develop compliant actuators for the lower limb joints and prepare them for integration into the available exoskeleton mechanical structures (BETTER and HYPER). The realizations in this WP are expected to offer an innovative interface between the BioMot sensory-motor system and advanced actuator technologies, implemented in WRs. This task will be led by VUB. The objectives of this WP are: (1) To create a physiologically correct, subject-specific model of the human lower extremity to be used for observing the muscle and joint operation during human locomotion in vivo, (2) To identify how an individual's neuromuscular effort is modulated throughout the execution of a locomotion task, (3) To identify how an individual's joint compliance is modulated throughout the execution of locomotion tasks, (4) To identify how the estimates from (2) and (3) are modulated as a function of the motor support provided by the WR worn by the subject, (5) To exploit the estimates from (2), (3), and (4) to establish a symbiotic relationship between the human operator and the WR. This task will be led by UNIPD. The main objective of this work package is to transfer the results from WP1, WP2 and WP3 into modular robotic joint systems (compatible with bioinspired high-level control) to investigate the biomechanics of joint movement assisted by wearable modular joint systems under the BioMot framework. In this task a first phase of integration takes place to build the embodied sensory motor skills. The objectives of this WP are to: a) develop the physical robotic simulators (modular controllable orthotic joints); b) implement sensor-driven circuits for control of joint motion and merge them with musculoskeletal model solver developed in WP3; c) physically test robust methods for control of (single) joint motion and stiffness; d) perform testing in experiments with humans wearing partial demonstrators, e) derive multi-joint interventions for further integration (WP6) and testing (WP7). The research will be structured to realize actuation with adaptable supportive actions that allow unhindered as possible gait and stable response to ensure basic supportive mechanisms in walking (knee stabilization, foot clearance, etc.) and volitional changes in dynamic gait. This task will be led by CSIC. This WP will discuss the theoretical aspect of the artificial controller for a) investigating learning and adaptability in artificial controllers, focusing on adaptations to alterations in environment and task constraints and b) adding to the high-level processing for developmental guidance of coordination under an unsupervised learning structure. We use the control principle of biological learning systems, tacit learning, to create the theoretical foundation of the control system for BioMot. In tacit learning, the primitive behaviors that are composed of the reflexive actions to cope with the environmental inputs are tuned to the sophisticated behaviors adapted to the environment though the body/environment interactions. We will develop the control theory of creating the appropriate motions of BioMot based on this learning process for the two application scenarios. This task will be led by RIKEN. This WP will perform the research to embed and understand the emerging sensory motor skills during human-robot interaction in gait processes. This implies the complete the integration of the biomechanical and sensory-motor levels with developmentally guided coordination in the BioMot cognitive architecture. The computational simulations for selection of motor support and compliance (WP3) and the control levels that were integrated and tested in partial demonstrators (WP4) will be extended to multi-joint actuation for walking. Higher-level learning algorithms (developed in WP5) will be integrated in the control architecture to constitute the smart WRs for the experimental scenarios. One fully integrated system will be developed for each experimental scenario. These will be used as experimental platforms to empirically study the WRs performance and human-robot interaction in WP7. This task will be led by CSIC. The central aim is to investigate the application of the unified framework for dynamic sensory-motor interactions to develop complex cognitive capabilities in WRs. This involves the study of self-stabilization and adaptability of the integrated robotic systems. The evaluation of the proposed theory will be conducted not just in terms of its components, but also on a system level. Our approach will be to systematically define the degree of situational variation with which the integrated exoskeletons should be able to cope in the experimental scenarios with intact and abnormal sensory motor systems. This WP will therefore systematically analyse the experimental integrated systems and conduct experimentation to reveal basic principles governing human locomotion with the novel smart WRs equipped with bioinspired sensory motor skills. The embodied artificial cognitive system will be used in the wearable exoskeletons in multiple dynamic locomotion tasks under two scenarios: gait support (interaction with intact motor and sensory systems) and gait training (interaction with abnormal motor and sensory systems). The procedures will be implemented to reveal how neural circuits generate behavior, and to yield new understanding of the interplay between neural and musculoskeletal systems for stability. The feasibility and applicability of the developed computational models will be tested based on the experimentation with the WRs. 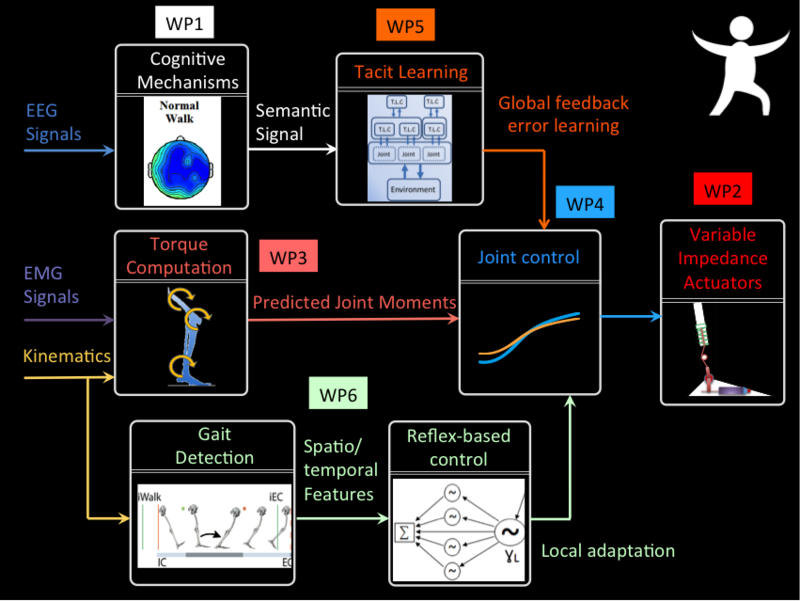 The WP will deliver a detailed assessment of the technical aspects of computational models of cognition and compliant actuation of WRs from an engineering point of view, to realize a human-robot interaction that becomes successful (clinically, etc.). This task will be led by FUHNPAIIN. This WP is aimed to investigate the possibilities for exploitation of BioMot outcomes while protecting the exploitable results and disseminating scientific results. Work in this phase will be allocated along the project life cycle. A dissemination and exploitation strategy will be defined at the beginning of the project. This will result in an activity plan (e.g. potential partners to be approached, conferences and exhibitions to attend). These activities will be developed through the project and will intensify when the first results are available. This task will be led by OSSUR with support on exploitation of exoskeleton technology by Technaid S.L. (TECHNAID, Partner 7) and from all other partners in exploitation, and research and clinical partner in dissemination. This task will be led by CSIC. 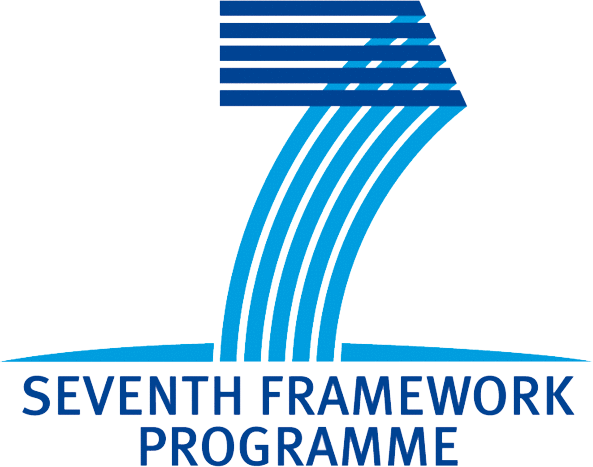 The objective here is twofold: (1) to plan, monitor and apply corrective actions in response to deviations concerning project work and resources, and (2) to manage all communications, reporting and financial administration between project consortium and the commission. Given the integration-focused approach of work proposed, and the ambitious nature of the target integrated systems described in Section 1.3.8, management has a central role to play in making the project a success. In addition to handling the administrative and financial aspects of the project, the management will be actively involved in facilitating and monitoring progress. Central to this process will be the task of ensuring timely exchange of new knowledge and results between WPs, particularly when these relate to integration (see Figure 4). In our experience, the project success is critically depending on our effectiveness to guarantee an integration that produces work that is truly integrated. Also, a critical task of the management will be to monitor and measure the overall progress of the project. This monitoring, via regular progress reports, will allow the management to provide additional scientific direction over the project's lifespan, with support of a Steering Committee. Part of this will inevitably include regular re-evaluations of whether the project's stated scientific aims are being met, and assessments of changes required to adjust the direction of the research or the nature of the targets being set across the work packages.